A new book is just out – Ordered Estates: Welfare, Power and Maternalism on Zimbabwe’s (Once White) Highveld – by Andrew Hartnack, and published by Weaver and UKZN Press. It addresses many of the themes highlighted in the blogs of the past two weeks, and is based on research carried out over the last decade on a number of Highveld farms, as well as with farm worker welfare NGOs. Once you peel away the layering of sometimes unnecessary theory (it was originally an anthropology PhD so that’s the excuse! 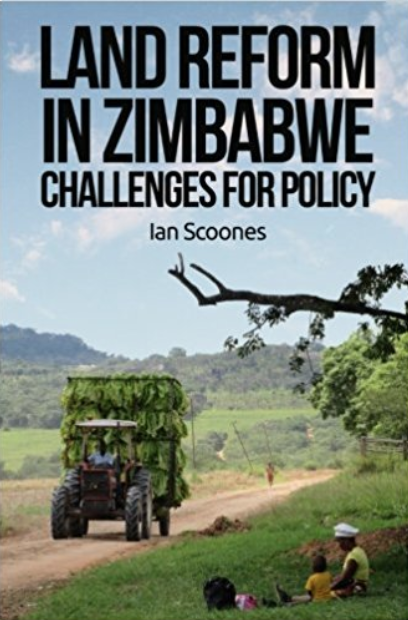 ), the empirical stories shared in the book’s pages have much to offer our emerging understandings of post-land reform Zimbabwe (see also earlier blogs on his work). The book fills an important gap in the literature, as it offers a nuanced account of the history of farm workers’ rights, as well as a reflection on changing fortunes since 2000. The ‘ordered estates’ of the colonial era have been much described. Blair Rutherford’s classic work from Karoi/Hurungwe told this story well, describing the constrained ‘domestic government’ that disciplined and controlled in the narrow, paternalistic world of white farms. Post-independence this reformed somewhat, and the limited sovereignties of the farms were extended as the state insisted on labour laws and other regulations, and NGOs took up the plight of farmworkers, creating new, more technical-bureaucratic, ‘practices of rule’. This book deepens this analysis, particularly with a focus on ‘farmers’ wives’ and their role in welfare organisations – hence the reference to ‘maternalism’ in the title. It also shows of course that there was not one single approach to labour in white farming areas; not surprisingly all farms were different, depending on characters and contexts. The post-independence developmental attempts to modernise, civilise and improve resulted in a range of initiatives on the farms from schooling programmes to orphanages, often with heavy involvement of ‘farmers’ wives’. But by ‘rendering technical’ the inequalities of land and labour regimes, such welfare efforts did not address the underlying challenges, and welfare was more sticking plaster rather than fundamental reform. Following land reform in 2000, such NGOs have not found a new role, focusing on displacement, but not on the new lives and livelihoods of their former ‘beneficiaries’. However, it is in the examination of the post-land reform period that this book cuts new ground. Building on, but also critiquing (as with some other recent literature somewhat gratuitously and inaccurately in my view), the important work of Walter Chambati, Sam Moyo and others, the book paints a detailed ethnographic picture of how farm workers carve out new opportunities in an highly challenging economic, social and political environment. This is the period of ‘crooked times’, where a ‘zig-zag’ approach to the kukiya-kiya economy is vital to survive. This is the world where there are no standard jobs – in the form of regular wage work – and where entrepreneurial informality emerges, with new forms of distribution, dependence and personhood, as James Ferguson describes for South Africa. Whether in the case of the Harare peri-urban settlement described in Chapter 5 (discussed previously in this blog) or the biographies of former farm workers profiled in Chapter 7, mixing new farm work with urban living, the new precarities of life in the post land reform age are well described. New ‘modes of belonging’ must be generated, very different to the ordered safety, if extreme exploitation, of what went before. What was missing from the book I felt was more detailed information who moved to what new occupations and where they ended up to provide the bigger-picture context to make sense of the fascinating detail. The book acknowledges the problems with the existing statistics, quoting both the CFU and other sources, and (somewhat bizarrely) just takes an average number, as a ‘middle way’. Getting a national picture may be impossible, but it would have been good to know what happened on those on the farms studied, and get a sense of how outcomes for farm workers were differentiated and why, in order to locate the few, if fascinating, individual cases. There are hints though at wider patterns. Those few white farms that have persisted have often maintained a network of loyal farm workers, some who provide protection and support through their links, and the book offered an interesting case of this dynamic in Chapter 7. At various points, the book suggests (I think very accurately) that turnover on A2 farms was particularly damaging to farmworkers, as production collapsed and some A2 farmers did not maintain their operations. But it also suggests that ‘successful’ A2 farms nearby took on workers, and so there is often a regional labour economy that is important to understand on the new farms. The book did not however get into any detail on what happened post land reform to groups of farmworkers in farm labour compounds, and especially on the A1 farms (after all the largest areas), as we have been trying to do in Mvurwi. It therefore missed out on the dynamic described in the blogs over the last two weeks, of farmworkers becoming farmers – along with much else – in the new ‘crooked times’ of the last 16 years. Despite shortcomings (this was after all a single researcher doing a research degree, so no blame there), this is a most valuable contribution, and coming from a white Zimbabwean (as he admits not from a farming background) perhaps especially powerful. When you next hear misinformed statements about Zimbabwe’s former farmworkers, please turn to this book for an informed, nuanced account that sets an important agenda for future research and policy debate. What are former farm workers doing 16 years after land reform? There has been much debate about the fate of ‘farm workers’ following land reform, with discussion focused on displacement and dispossession (and many dodgy numbers touted around), but relatively little about what has happened to this group since (although this blog has tried). Today we must ask, is the term ‘farm worker’ now irrelevant, and do we need a more nuanced characterisation? Our research in Mvurwi area in Mazowe district suggests the answer is yes. Those who were once workers on white commercial farms are now carving out new livelihoods on the margins of the resettlement programme, often under very harsh conditions. Their challenges are barely represented in wider debates on future rural policy, with the focus being on the new settlers. How they are surviving, and how they are integrating within new farming communities following land reform, remains poorly understood, and under-researched. Fortunately there is new research emerging which paints a complex picture across the Highveld farming communities. In a couple of weeks I will review Andrew Hartnack’s excellent new book, Ordered Estates, for example. Our own research shows some similar patterns. On the three former large scale commercial farms where we are working near Mvurwi, now each subdivided into multiple A1 resettlement farms (a total of 220), there are three farm worker compounds, housing 370 families. Before land reform these families worked on farms across the district and beyond. Around half formerly worked on one of the three farms where we are working, the others came from 23 other farms, displaced by the land reform as compounds were closed and new farmers, particularly A2 farmers taking over larger farms, dismissed workers, and replaced or downsized their workforce. In the last 15 years, these families – and now their descendants – have had to carve out a living on the margins. The old system of employment, under the paternalistic ‘domestic government’, so well described by Blair Rutherford, has gone. In its place is a much more precarious existence, based on a range of unstable sources of income. Many work for the new settlers, others farm their own land, others do a range of off-farm activities, from brickmaking to mining to fishing. We interviewed 100 household heads, sampled randomly across the compounds, and asked whether they thought their life had improved, stayed the same or got worse since land reform. Contrary to the standard narrative about former farmer workers, we were surprised to find 56% of informants saying that things had improved. IM commented: “Life in the past was very hard. It’s definitely an improvement today. I didn’t even have bicycle then, no cattle. Now I farm a bit, and have both”. How are people improving their livelihoods, and what is happening to those who see a deterioration in their livelihoods? Our studies have aimed to find out. What is clear is that a single designation of former farm worker is insufficient. Today, this is a much more differentiated group. In the past there were grades of different jobs, with drivers, cooks, foremen and others with managerial posts getting better conditions and pay than field workers. But today, the differentiation is not based on jobs, but on a range of livelihood options being followed. Access to land in particular is crucial. In many ways, the people living in the compounds are not so much workers in the classic sense, but more represent the ‘fractured classes of labour’ that Henry Bernstein has described, mixed in with aspiring peasants and petty commodity producers. Across our three farms there is a clear difference between those with plots of land, and those without – or with only small gardens. Some former farm workers gained land during the land reform. Across our sample 19 A1 households are headed by former farm workers or their sons, representing 8.6 per cent of plots. For those who remained in the compounds in two of the farms, access to 1 ha plots was negotiated following land reform, with the approval of local politicians, the District Administrator and the Department of Lands. This arose out of major disputes, particularly around the 2008 election, between the A1 settler farmers and those living in the compounds. For others small garden plots are available, and these can be vital for household survival. In addition, there is a growing rental market in land, as A1 farmers unable to use their full allocation of land, rent out small plots (usually 0.1-0.2 hectares) to compound residents. This helps hook them into labour relations, and means that often highly skilled workers are on hand. Before land reform farming was not possible for those living in the compounds. The white farmers on these 3 farms sometimes offered ‘lines’ within their fields as an alternative to rations, but farm workers were not allowed independent incomes. This was a highly controlled setting, with paternalistic, sometimes violent and brutal, control creating a system of dependence and fear. Of course former farm owners were very different, and some were better than others, as the testimonies of farm workers clearly show (see next week’s blog for some extended case studies), but the expectation was that those living in the compounds were under the control of the farmer, and expected to work in return for pay, housing and some amenities. Today the housing has to be maintained by the residents, there is no regular pay (except for a few who have been employed permanently by the new settlers) and school or clinic fees must be paid for. The table below offers some basic data, contrasting four different groups: those who got land under land reform and are now A1 settlers but were formerly farm workers (or their sons); those living in the compounds with plots of more than 1 ha; those with plots/gardens of up to 1 ha; and those without land (or just small gardens by their houses). The contrasts are stark. Those who managed to get land during the land reform are doing relatively well (21 households of the 220 settlers across the farms). Their skills learned on the commercial farms are paying off. Even though they have much lower land areas than others in the A1 settlements, they have reasonable production and on average cultivated 2.5 ha in 2014. This resulted in a surplus of maize being sold, and tobacco being marketed. As a result, they are accumulating cattle and other goods, building homes and employing people themselves from the compounds. But those living in the compounds are not all the same. There are some (26 per cent of our compound sample) who are more akin to the poorer settlers, or those in the communal areas, who have on average 1.5 ha, renting in a further 0.3 ha. They produce about three-quarters of annual family food requirements from maize, while also selling tobacco and engaging in other work. Their reliance on selling labour is limited, although at the peak of the farming, curing or grading season they may be hired. Many had higher grade jobs before, and may be sought out for advice. They have started accumulating and are investing in cattle in particular (but also a whole range of other goods, including solar panels, water pumps, bicycles, and a few have bought cars). Then there are those with some land but under a hectare, although also renting in land (52 per cent). This group is more reliant on labouring and other off-farm activities. Many are engaged in trades, including building, carpentry and so on, servicing the A1 areas, but on their own terms. And finally there are those who have only home gardens, although some are renting in land (average 0.2 ha, hence some maize/tobacco production), and are highly reliant on selling labour to land reform farmers (22 per cent). Labour organisation may involve farmers turning up with a pick-up and recruiting on the day, or may be mediated by a local broker (often a compound member) who is in mobile phone connection with a number of farmers, both A1 and A2, and directs people to work openings, again by mobile phone. The proportions in these categories of compound dwellers is not fixed, however. Proportions change season by season and over time. What we see is an emerging class differentiation among former farmer workers, driven in particular by access to land. In discussions around whether lives have improved or deteriorated, everyone mentions land, as well as employment conditions. Land access is however limited, and political gatekeeping means that not everyone can benefit. Allocations of land since the land reform within the three farms we have studied have depended on complex negotiations between those in the compounds and local political leaders. New settlers are suspicious of those in the compounds. Cheats, thieves, foreigners, MDC supporters and worse are the descriptors often used. This antagonism is not universal however, as settlers are well aware they need the labour and skills of those living there for their tobacco production. Good relations in the end are necessary, and accommodations have to be found. Brokering by local politicians and traditional leaders resulted in the concessions of the 1 ha plots; and land deals with nearby A2 farms to avoid antagonism have also occurred. Compound leaders, usually with connections in ZANU PF, have been able to create opportunities, but only for some. Usually it is the older, male, better educated, previously higher grade employees have benefitted, while the youth, single women and others with fewer connections have not, as profiles in next week’s blog will show. While the policy discourse continues to focus on displacement and farm worker rights amongst the NGOs and human rights community, those who used to be farm workers themselves have had by necessity to get on with life. They know the situation has changed and have to negotiate the new reality. As discussed, some have benefited, others not. But right now, there is an urgent need for a more informed policy discussion about what next, and move the policy debate on. 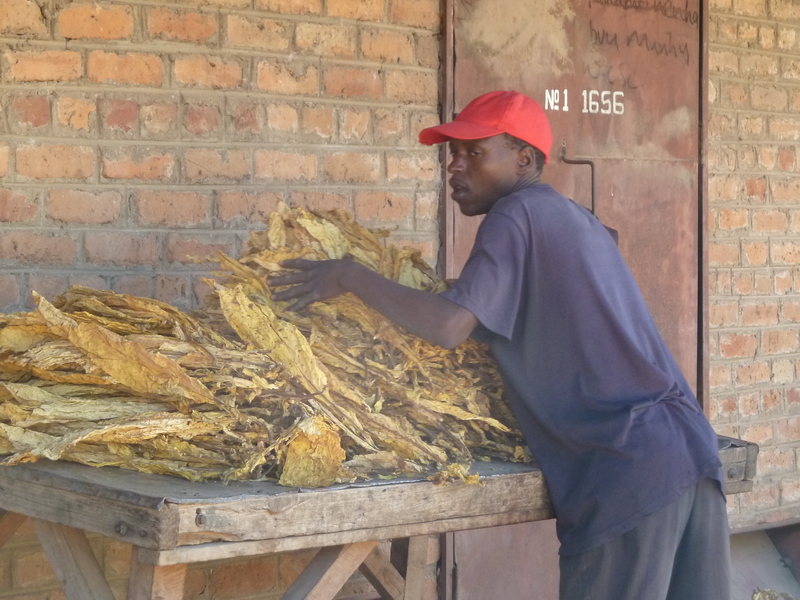 Tobacco production, now the mainstay of Zimbabwe’s fragile agricultural economy, is being grown by a large number of new land reform settlers (amongst others). This production is reliant on labour, yet its organisation is very different to what went before. This suggests new challenges and priorities for policy and advocacy. Some important new questions arise. What labour rights do those living in the compounds have? What land is required as part of a national redistribution to sustain their livelihoods? What is the future of the compounds, sitting as an anomaly in the new resettlements, a reminder of a now long-gone past? These questions are barely being discussed, and much more research and informed debate is urgently needed. The next couple of blogs will offer some more on this theme, with the aim of raising the debate. There is little doubt that farm workers lost out with the land reform, but what has happened to them since, particularly those who remained on the farms? Too often commentary on farm workers has portrayed them as passive victims. But new work demonstrates their agency in a variety of ways. They were of course active agents, both before and after the land reform. Based on in-depth ethnographic exploration, this work tries to explore how different farm workers (not after all a uniform category) have reconfigured their lives in response to the new agrarian structure. There is, as ever, a complexity to the story not offered in standard accounts. In particular I can recommend an often overlooked 2009 paper by Andrew Hartnack that offers a particularly nuanced account. He shows how “through local responses to displacement, displaced workers are able to counter the discourses of the powerful by subverting global, national and local representations, using local agency to create their own practical discourse of displacement”. Farm workers have always been represented in particular ways by public, media and political commentary. In the past, as Blair Rutherford has described, white farmers often related to labour in hierarchical and paternalistic ways, constructing citizenship and identify outside the influence of the state within the confines of the farm. Hartnack argues that the limited earlier research on farm workers often projected a simplistic image of workers as victims of racial discrimination and capitalist agriculture or, in direct contrast, they were characterised by commentators such as R.W. Johnson as having lived under a ‘cosy arrangement’ or ‘protective umbrella’, now disrupted by land reform. In the 2009 paper Hartnack comments: “While undoubtedly well meaning, much of it [the literature] essentially denied farm workers agency or cultural competence, portraying them largely as poverty stricken, illiterate and powerless, giving the impression that they were passive victims of their circumstances”. In the post 2000 discourse, farm workers are again seen as victims, this time of ZANU-PF expulsions, while the nationalistic discourse presents farm workers as ‘foreign’ and stooges of white farmers and the opposition. “…workers used their ingenuity, skills and resourcefulness to manipulate the farm system to their own advantage. Farm workers may have been subordinated within capitalist relations of power, dependent on paternalism for survival, marginalized and stigmatized within society in general and made to feel insecure, but this did not stop them from learning how to benefit from and adapt to their situation”. And this experience helped farm workers and their families to cope with and respond to displacement when farm invasions took place. The experience of displacement is of course not uniform. 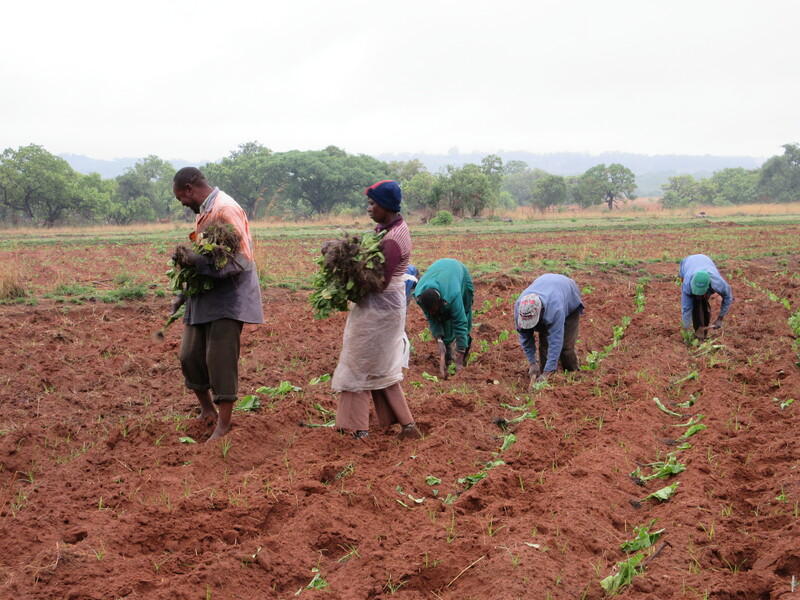 Workers living on a farm came from diverse locations, often from outside Zimbabwe, they had formed communities on farms, but with linkages between and outside that differed between families, men and women. 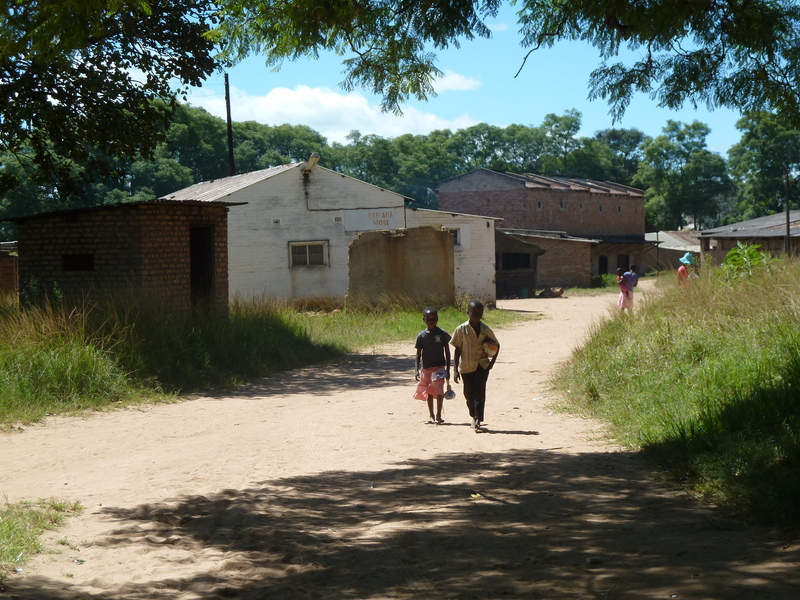 In a number of papers Hartnack describes the process of displacement and the living conditions of former farm workers living in a ‘holding camp’ on the outskirts of Harare. The insecurities, the poor health conditions, the oppressive patronage relations and political impositions, not least Operation Murambatsvina, are documented. “….piecework jobs that required either some measure of skill or experience, such as spraying for the flower-growing companies, or the capacity for heavy manual labour. Some men with experience in the Brylee flower nursery thus got jobs with the three different flower companies in the area. Others became builder’s assistants at the local housing cooperative and on private building sites. Some loaded bricks at the nearby brickfields, while other young men sought jobs as security guards. However, even those who found alternative employment soon after displacement found their wages inadequate to meet their increased need for cash, while their job security was poor in comparison to what they had enjoyed at the farm. Many of the available jobs were not easily accessible to women, being in the traditional realm of men. This meant that women, along with the elderly, struggled to maintain access to an income after displacement. Casual workers (traditionally women) had not had much work in 2002, as the disruption of the farm’s operations in the first three months of the year had reduced the need for their labour. Having had no wages, many casual labourers found themselves with very little cash at the time of displacement, as did retired workers. Female-headed households, which had relied on casual labour for an income, thus suffered badly as they did not have savings, and their members were often not able to find alternative jobs easily”. Four years later follow up research found a small number of senior, skilled workers had gained employment on their former farm, while others had used skills and connections to get jobs or land elsewhere, and had moved on. Others remained vulnerable, and were reliant on piecework, small-scale gardening, trading and other activities. In the context of new settlements new forms of patronage emerged, with displaced farm workers finding protection by church leaders, war veterans and others. Responses included a range of strategies of the ‘weapons of the weak’ – trickery, foot-dragging, feigning ignorance and more – and farm workers developed representations of themselves as compliant, pious, weak or ignorant in order to get by. All this allowed some room for manoeuvre in nevertheless highly constrained circumstances, allowing them to ‘blend in’ yet ‘remain apart’. Conflicts and jealousies existed between the new arrivals and those residents of the informal settlement to where the farm workers were displaced. This involved a tricky negotiation, especially at the beginning, although as time progressed greater integration took place. As readers of this blog will know, I have mostly worked in Masvingo province where large numbers of farm workers were not displaced, and there were few compounds of the sort found on the large-scale tobacco or horticulture farms in the Highveld. So it was fascinating for me to learn what had happened on such farms as part of an ongoing study in Mvurwi, Mazowe district. Here large compounds still exist, often housing hundreds of families; these are the ‘in situ’ displaced described by Godfrey Magaramombe, contrasting with those who were forced to move. But unlike in the early 2000s, a decade on these former workers are carving out new relationships with the farms that surround them, as Walter Chambati and others have shown. This has not been straightforward, and stories of conflict abound, but these farm workers are now finding work in a more flexible way than before. Today they move around between farms looking for work, often able to strike deals to their advantage. Given the skills many possess, they have become valuable resources in the new farm economy, providing useful agronomic and marketing skills. Women and men engage in this new labour economy in different ways. Employment is usually poorly paid and insecure, and the lack of an organised voice is a constraint. Most households based at the compounds also farm. Negotiating small plots of land from the neighbouring farm owners has been a key part of their strategy, and many will survive off such gardens, even marketing surpluses to supplement wages. Some have been lucky to get larger areas, as part of official allocations within the resettlements. We met several former farm workers who were now farming tobacco with great success. For new farmers with compounds within their farm boundaries, there are challenges too. With residents now incorporated into schools in surrounding areas, there is less of an obligation to provide services, but there are issues of welfare and security. A new farmer must deal with his neighbours well to avoid an escalation of theft or trespass. Thus many have started up relationships with committees within the compounds to negotiate access to land, water, electricity and to discuss issues such as the upkeep of farm buildings. These compounds are of course anomalous inheritances from an earlier agrarian structure, but have to be accommodated, as people, often second or third generation migrants, have nowhere to go. While not denying hardship and vulnerability, the experience of former farm workers was not simple victimhood, characterised by passivity and lack of agency, but a much more active struggle. However despite this variety of strategies, access to new livelihood opportunities was again highly differentiated. Just as there is no single or simple story for land reform and the successes or otherwise of the ‘new farmers’, there is no standard story for farm workers, as is sometimes suggested. Detailed study of particular places and people, always contextualised, is essential for revealing the highly variegated experiences and outcomes.